George Osborne has told big business to back the Government or he will not cut the top rate of income tax for Britain's biggest earners to 40p. The Chancellor warned that he and the Coalition 'are putting their necks on the line' to help them prosper but not enough are speaking out to support them. In a speech to businesses leaders yesterday he slammed their 'near silence' when at the last Budget in March he agreed to cut the top rate of tax from 50p to 45p, to the anger of many Britons. And he added that the 'politics of envy' and 'anti-business sentiment' could end any idea to cut the rate back to 40p - if they fail to back him. 'If your voice is not heard then elected politicians are going to find it very difficult to put together pro-business packages because you leave the space open for everyone else,' he told The Times CEO summit. ‘If you are not out there, engaged, in those arguments, then you are going to leave the field open to those people who want to fill that space, and who argue that companies have got to pay more tax. 'At the moment we are having a pretty big argument about the size of the State and who should be taxed and what are the right levels of taxation are. If we don't get much voice from the business community then that is more difficult,' he said. The top rate of income tax will be cut from 50p in the pound to 45p next year for those earning over 150,000. The 50 per cent level was introduced by Gordon Brown in April 2010. George Osborne risked a political backlash by announcing that he would scrap the highest tax rate because he said it would raise five times as much in other tax raids targeted at the richest. 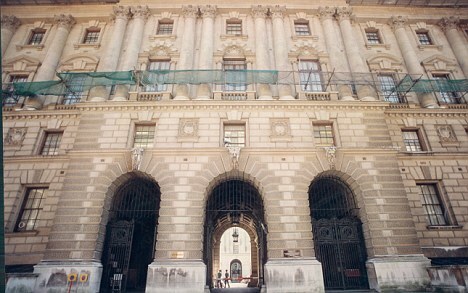 Critics said he and the Government had bowed down the the bankers and their giant salaries and bonuses. The Treasury also said the change was 'temporary', leaving the Chancellor with the chance to cut it back to the 40p rate later. In the same speech yesterday Mr Osborne accepted the March Budget, which caused him to do several sharp U-turns since, had led to 'lots of bad headlines' but added he was doing his bit to make Britain's economy more competitive. He added that in the 1980s Margaret Thatcher had won the argument that high-earners should pay less tax, because big business had backed her. In the same speech he said Angela Merkel may be willing to sacrifice Greece in order to persuade German voters to bail out the euro. The Chancellor suggested Germany may ‘require’ the crisis that would follow a Greek exit to convince its voters to take the unpalatable steps needed to rescue the single currency. ‘I ultimately don’t know whether Greece needs to leave the euro in order for the eurozone to do the things necessary to make their currency survive. Here's what other readers have said. Why not add your thoughts, or debate this issue live on our message boards. I'd like to ask George Osbourne if he has ever run his own business - because the levels of taxation he is inflicting on anyone trying to run a business UK is preventing me from doing business? I can't lower my daily rate and also cover my business running costs - so I guess that I'm going to have to move my business abroad - perhaps to one of those low tax economies where this country continues to send huge sums in "aid"? Funny how their not listening to the majority of people in this country - perhaps they need to be reminded one person one vote!!!! Unless that systems a con as well? The rich can afford to hire accountants to minimise their tax bills, so they don't actually pay anywhere near the current 50%. Some of them end up paying 10% or less. Proportionately speaking, the poor pay more tax than the rich. Thought blackmail was a crime in this country!!!!! Despite saying consistently since the election in 2010 , " This is clearly NOT the right time to be reducing the 50p top tax rate " the government under Cameron choose the middle of a self created, double-dip recession as 'the right time' And this government thinks it's more competent than the last ! ,..................... you've got to be kidding me ! Has this man no shame? - Robin, London, 13/6/2012 11:44----------------No, none whatsoever. 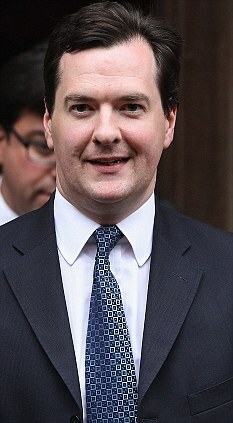 When somone reports Mr. Osborne referring to Big Business; isn't this just politicalese for financial institutions? I fully back a reduction in tax rates and a cut to the welfare bill to fund it. Anyone that doesn't support a tax cut doesn't have a clue about economics and how to spur growth. This vast loss of wealth was compounded by a loss of income, as the earnings of the median family fell by 7.7 percent over the same period. The new data come from the Fed's release Monday of its triennial Survey of Consumer Finance, one of the broadest and deepest sources of information about the financial health of U.S. families. The latest survey is based on data collected in 2010. Figures are reported in 2010 dollars. Unsurprisingly, the report is full of grim news, and although it is news from 18 months ago, fresher sources of economic data make clear that most households have since seen only modest increases, at best, in wealth and income. Despite these setbacks, consumers have continued to spend surprising amounts of money in recent years, helping to keep the economy growing at a modest pace. The survey underscores where the money is coming from: Americans are saving less for future needs and making little progress in repaying debts. The share of families saving anything over the previous year fell to 52 percent in 2010 from 56.4 percent in 2007. Other government statistics show that total savings have increased since 2007, suggesting that a smaller group of families are saving more money, while a growing number manage to save nothing. The survey also found a shift in the reasons that families set aside money, illustrating the lack of confidence that is weighing on the pace of economic growth. More families said they were saving as a precautionary measure, to make sure they had sufficient liquidity to meet short-term needs. Fewer said they were saving for retirement, education or for a down payment on a home. And the report highlighted the fact that households have made limited progress in reducing the amount that they owe to lenders. The share of households reporting any debt declined by 2.1 percentage points over the past three years, but 74.9 percent of households still owe something and the median amount of the debt did not change. The drop in reported incomes could have increased the weight of those debts, requiring families to devote a larger share of income to debt payments. But one of the rare benefits of the crisis, lower interest rates, has helped to offset that effect. Families also have been able to reduce debt payments by refinancing into mortgages with longer terms and deferring repayment of student loans. The survey also confirmed that Americans are shifting the kinds of debts that they carry. The share of families with credit card debt declined by 6.7 percentage points to 39.4 percent, and the median balance of that debt fell 16.1 percent to $2,600. Families also reduced the number of credit cards that they carried, and 32 percent of families said they now had no cards, up from 27 percent in 2007.